21996LF-SS is rated 3.9 out of 5 by 80. Rated 5 out of 5 by Linda Sue from Good quality and value I didn't realize until I installed my Delta faucet, what a difference a quality product such as yours would make. 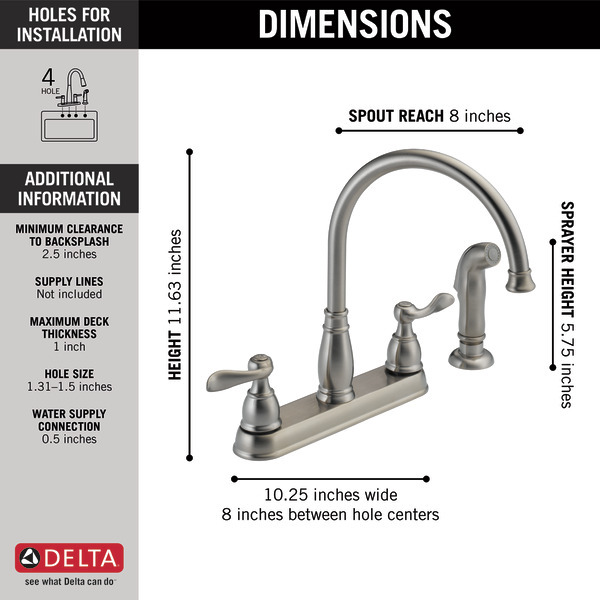 Rated 5 out of 5 by tekee from Great service Called for repair parts on my Delta faucet and was pleasantly surprised at the service I received. Rated 5 out of 5 by Scout from Love the black and bronze accents This is my second one of the same faucet. Bought one in 2011 and it started to sound funny so just went ahead and replaced it. Great for the price. Rated 5 out of 5 by SSCSteeler from Very nice! Well worth the little cost over the classic model. Rated 5 out of 5 by OregonCoast from Nice Set Purchased a month ago, installed by a professional, had a knock off just like it that failed. 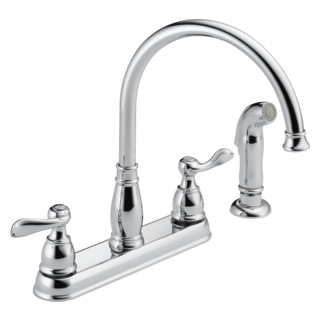 The quality difference was apparent from the first, the way the spout swings, the way valves deliver the water, and a lifetime warranty to boot. My wife and I could not be happier. 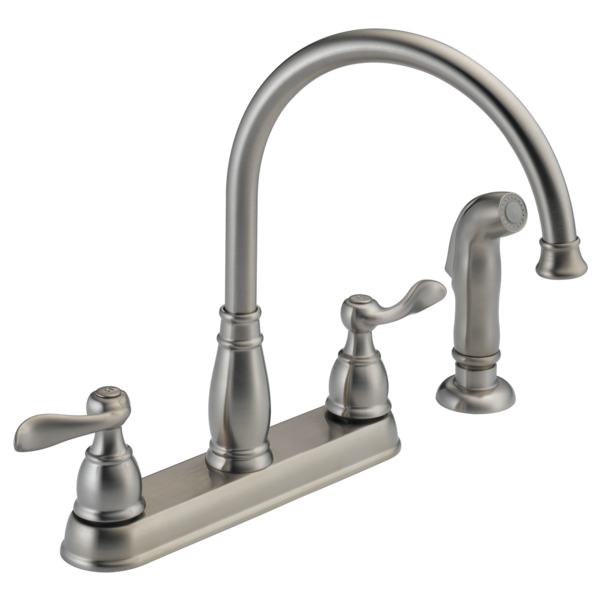 Rated 3 out of 5 by Jackhammer81 from Love the faucet....but We've loved this faucet since day 1. It compliments our kitchen decor perfectly. However the spray attachment is another story. We've battled leaks from it starting the second week. Now water pours out the trigger assembly. I came here to order a replacement sprayer but I'm not going to spend $63 dollars for something that appears will have the same problem. I'll look around and see if I can locate a sprayer that works without leaking. DELTA, You make outstanding products but how can you charge $63 dollars for something that apparently is poorly designed and destined to fail? I cant recommend this product on this count alone. Rated 5 out of 5 by jwreedjr from An instant upgrade to our kitchen! We did not realize how outdated our kitchen faucet was until we replaced the 20-year-old with this faucet in chrome and sprayer. I look for reasons to turn it on! Next, we will do the bathroom faucet as well. 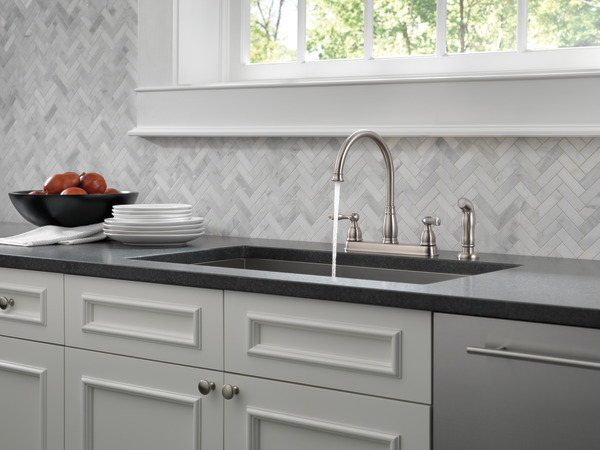 Is the Brilliance stainless finish similar to brushed nickel? Will it match or clash with a stainless steel sink? I replaced a brushed satin with this one and it looks great. I have black garnet counter top. What is the thread size for the faucet nozzle? I need to get an adaptor for it to use with my Kenmore portable dishwasher. is the faucet's body solid brass, or plastic? Brass is recommended for a longer-lasting faucet body, over plastic, which wears out in about 5 years, or so. Can this be installed without the sprayer? I have two questions: Is there a 2.2 aerator available for this faucet? Can you tell me why there is a water restrictor or water saver in the CARTRIDGE when the aerator has a water restrictor/saver already? I was told by someone that the cartridge has another restrictor feature. Thank you. Either a Brita or Pur cartridge filter will work.